A true startup in Newport News, James River Signs is owned and operated by Dave and Ann Gupta. 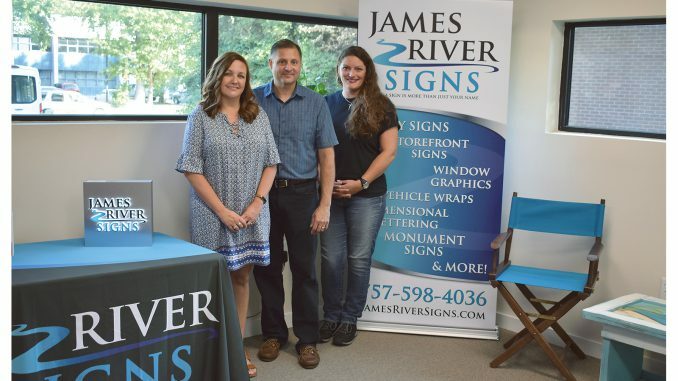 After spending 25 years in the corporate world, the couple decided it was time for something different and opened the doors for James River Signs on May 1. “We researched and saw all the different materials and creativity out there. We’re trying to show people things they may not have thought of for marketing their business,” Dave says. While learning the technical aspects of creating signage was a learning curve, Dave and Ann brought on a graphic designer with more than 15 years of industry experience. Linda Cassada does all of the graphic design and helps with some of the technical aspects, while Ann handles a lot of the web marketing and social media. Dave focuses on sales, and both Ann and Dave handle the finances and accounting. Like most entrepreneurs, Ann and Dave wear a lot of different hats on a day-to-day basis. James River Signs works with a full spectrum of clients, from businesses and retail to churches and vehicle branding. Being a technological guy, one of Dave’s favorite projects was installing a digital sign for Pollard’s Florist. On the other hand, Ann’s favorite project has been a recent one working with Newport News Public Schools, creating library murals for Newsome Park and Stanford elementary schools. Ann’s background is in education, and she taught second grade before spending 19 years out of the work force to be home with their three children. Adjusting to their new lifestyle has been more challenging for Ann than Dave as she moves back into a 9 to 5 schedule. Since Dave was already used to a regular schedule from his years in the corporate world, Ann is still finding the work-life balance after being home for so many years. “But working with Dave hasn’t really been a challenge—most days,” Ann says with a laugh. Ann and Dave both grew up in the Midwest. They met in college at the University of Illinois and gradually worked their way east for corporate assignments. They’ve now lived in Newport News for 19 years since their oldest daughter was born. With children ages 19, 16 and 12, they keep busy with all of the children’s activities when not running the business and love that they can create a schedule that ensures they don’t miss out on those things. As a family, they love spending time at the ocean and beach. “You can tell we spent 20 years in the Midwest,” Dave says. Ann and Dave hope to bring a modern, high level of professionalism and customer service to the local community with their experience from the corporate and education worlds. Ann loves that they work with businesses they get to drive by every day. 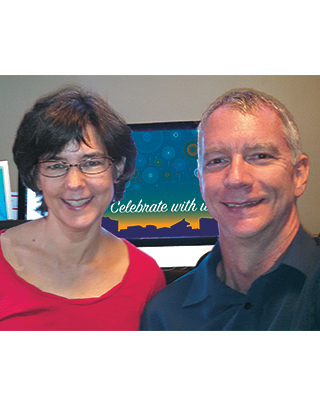 Sara and Stewart Sanders have been Graphic Designers for the Oyster Pointer since 1993.